On receiving A FLICK OF THE FINGERS, I am ashamed to say that, much as I pride myself on my knowledge of cricket, I had not heard of Michael Burns’s subject. I imagined that there must have been something about John Neville Crawford AKA Jack that merited someone’s time and energy in researching what I thought was an obscure subject. 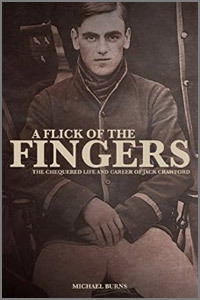 Jack Crawford, though, soon proved himself to be a fascinating and most worthy subject. Through the discovery of a collection of Jack Crawford’s scrapbooks and memorabilia, Michael Burns has brought to life the story of the life of a formidable all-rounder for Surrey and England in the early part of the 20th century. Born the son of a clergyman who loved cricket and ran an asylum, Crawford, educated at Repton and surely becoming one of its most famous alumni, made his name not only through his ferocious hitting but for being banned for life by Surrey for refusing to captain a weakened side against the touring Australians, did the double in his first two full seasons and was, for many years, England’s youngest Test cricketer. A man seemingly confident of his abilities, Crawford emigrated to Australia where he continued to further his name as an exciting cricketer and married a girl of German extraction but later divorced. He went to New Zealand and appeared to know his worth before returning to England where, towards the end of his cricketing career, was forced into mundane office life which he stuck at for many years. It can be safely said that Crawford was more than a match for all the greatest talents in cricket’s Golden Age. It is a slight shame that, whilst his exploits are compared with other great all-rounders through the years, there are no statistics given but, then, statistics cannot express the pleasure which Crawford appeared to give to the public. The book is further improved by a decent collection of photographs. Thanks to Michael Burns, the fascinating tale of Jack Crawford has been brought back to life to those who knew of him and brought to life to those who haven’t come across him. I feel even more ashamed now but much the richer and wiser for reading A Flick of the Fingers and wholeheartedly recommend it.